Acid cigars are the ingenious twist the cigar industry had been craving, they are the perfect embodiment of Drew Estate - which of course, represents 'the rebirth of cigars'. While the cigars showcase a brilliant and modern, artsy look and feel, it's the wild and unique flavor combinations that truly set Acid cigars apart. The 'infusion' process used to create Acid Cigars is a highly guarded secret - though it is known that the cigars undergo a unique curing process, involving months of aging and 'infusing' with pure and organic fragrances. Premium tobaccos meet pure creativity to form a cigar (and smoke) like no other! Intensionally given vague titles, the cigars are meant provide an experience - it is up to the smoker to decipher their own take on each cigar's distinct profile. 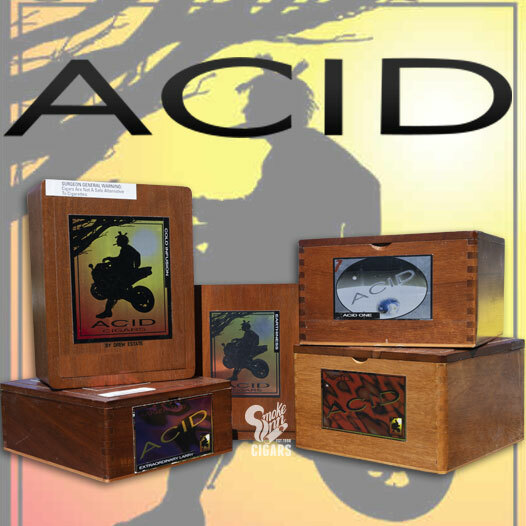 Experience the original, try an authentic Acid cigar today.